Definition: The purpose of the side-by-side display is to array quantitative and qualitative data together. The side-by-side display has two columns. Each column displays coded segments or summaries for each of the two studies. The rows of the table are made up of themes, in this case your codes. This joint display is especially suitable for convergent designs, where a qualitative and a quantitative study are conducted independently or for the final integration of an explanatory or exploratory design. 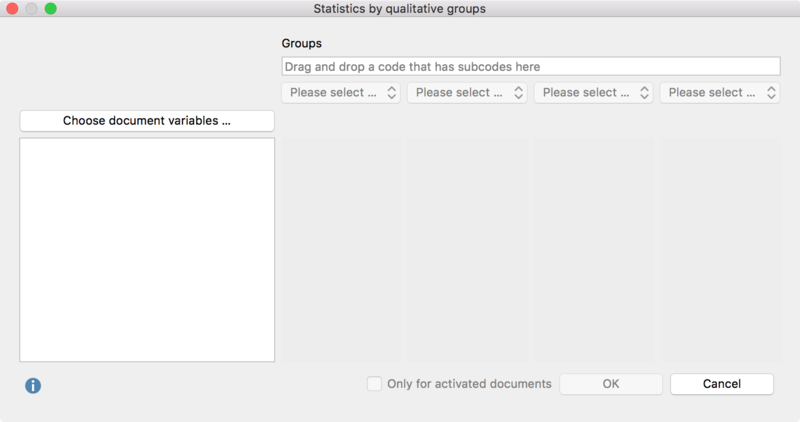 Drag and drop a document from the “Document System” into each of the fields for “Qualitative study” and “Quantitative study” with your mouse. Drag another document into a field to replace a document you already selected. Drag and drop any number of codes from the “Code System” into the “Themes” box on the left. Codes can be rearranged with the mouse. Codes can be removed from the “Themes” box by dragging the code out of the box or selecting the code and pressing Del key (Windows) or cmd-Backspace (Mac). Check the box next to Include comments of coded segments to include comments. If a comment exists, it will be displayed below the coded segment in the final display. This option is not available for side-by-side displays created for summaries. After clicking OK, a dialog window will appear where you enter a file name and select the location on your computer to save the display to. 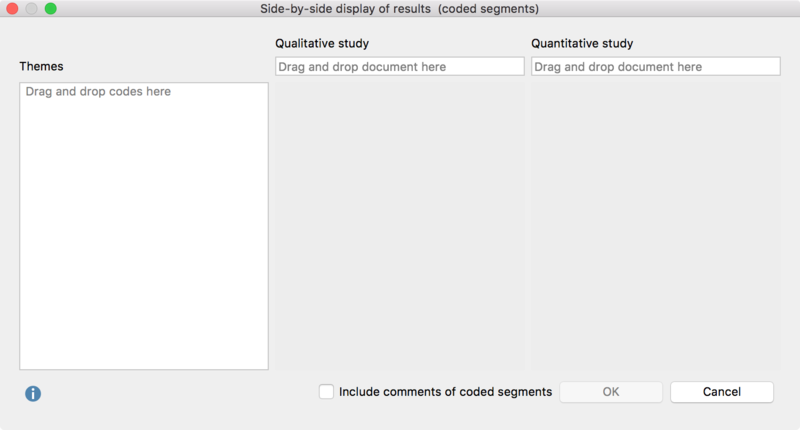 MAXQDA generates an Interactive Quote Matrix with two columns for a side-by-side display with coded segments, so that you can explore this display interactively. You can find further information on how to work with this results window in the following section of the manual: Interactive Quote Matrix. For a side-by-side display with summaries MAXQDA creates a text file in RTF format and opens it in word processing programs such as Word. Definition: This joint display integrates data by arraying the qualitative data (segments or summaries) as one dimension and the groups formed by the quantitative data as another dimension. Each column displays coded segments or summaries from those documents with the corresponding variable value, separated into rows by themes (= codes). This joint display is especially suitable for explanatory designs, but could also be useful for convergent (parallel) designs. Select which groups to compare by selecting a document variable and up to four variable values from the drop down menus. MAXQDA will include all documents with the corresponding variable value in the final columns of the display. You can limit the display to only include currently activated documents by checking the box next to Only for activated documents. 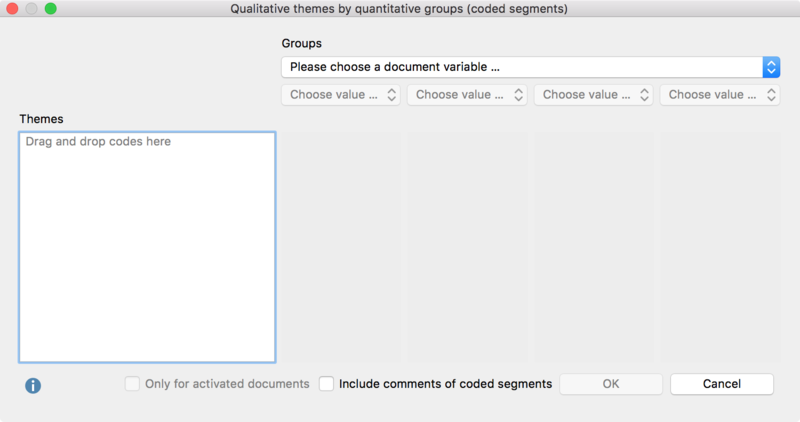 Check the box next to Include comments of coded segments to include comments. If a comment exists, it will be displayed below the coded segment in the final display. This option is not available for displays created for summaries. MAXQDA then exports the side-by-side display in a RTF document which can be read by Word and opens the document. The result of this display is similar to the result of a Quote Matrix. Definition: This joint display integrates a qualitative typology as one dimension with the quantitative data as another dimension. Each column holds all documents, in which the selected subcode occurs. It is therefore important that only one of the subcodes is assigned to each document. An example could be an evaluative qualitative text analysis where the code “self assurance” has the subcodes “low,” “medium,” and “high”. If one of the subcodes is assigned to each document, they can now be used to create this joint display. This joint display is suitable for convergent (parallel), as well as explanatory and exploratory designs. Create groups by dragging a code that has subcodes (but no sub-subcodes) from the “Code System” window to the “Groups” field at the top of this window. Select up to 4 subcodes from the drop down menus below. 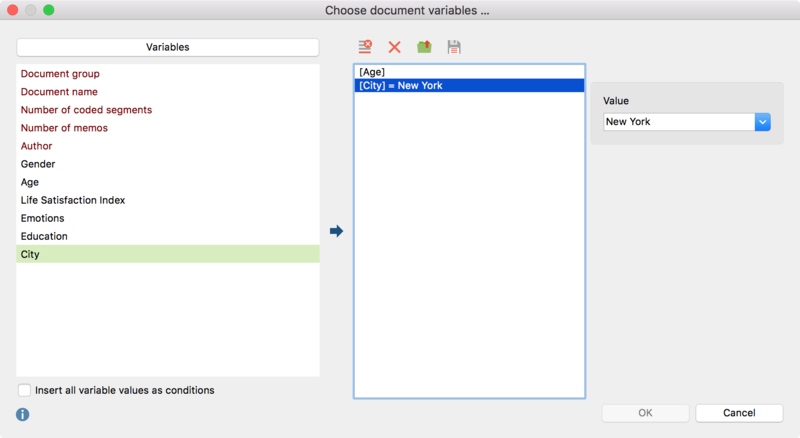 Click the “Choose document variables…” button to call up the variable selection window. Select which variable values to include for categorical variables. Click OK to include your selection and click OK again to create the joint display. The result of this display is equal to that of a typology table.